Leanne has been a member of the Sturt Badminton Club from the age of ten years old. Leanne started playing in junior league and then graduated to playing in the senior competition at an early age. Leanne has represented South Australia on numerous occasions, her first State team was in 2004 at the June Bevan Under 17 National Carnival held in Auckland, New Zealand. In 2006, Leanne at the age of fifteen, won the triple at the Under 17 National Championships in Perth, Western Australia - the first South Australian to win the triple title at a National event. Leanne then became the first South Australian to win the triple at the Under 19 Australian Junior Championships in 2008. Leanne has also represented South Australia at Senior Level and was part of the winning team in 2010 when it was held in Adelaide. She has also been selected to represent Australia on many occasions in Junior National Teams. In 2010, at the age of nineteen, Leanne was selected to represent Australia at the Commonwealth Games in New Delhi, the youngest player in the team. Leanne has won over 21 National Championships at Under 17, Under 19 and Senior levels. In 2011 Leanne deferred her university study to concentrate on qualifying for the ladies doubles at the 2012 London Olympics. This allowed her to compete overseas in international tournaments and gain valuable ranking points and earn automatic entry to the Olympics in 2012. Her highest world ranking was 26 in women's doubles in December 2011. In 2012, Leanne made her Olympic debut aged 21, reaching the quarter final play-off with women's doubles partner Renuga Veeran. This placed Leanne and Renuga in equal 5th position for the tournament. Leanne was selected again to represent Australia at the Rio 2016 Olympics in the mixed doubles event with partner Robin Middleton. Unfortunately Leanne and Robin were unable to progress beyond the preliminary rounds. Congratulations to Leanne Choo on again being selected to represent Australian at the 2018 Australian Commonwealth Games April 2018. Leanne and Renuga Veeran again competed in the Women's Doubles event While not ultimately successful, a highlight of the tournament was Leanne and Renuga Veeran taking on Ren-Ne Ong and Jia Ying Crystal Wong of Singapore in the Round of 32. Leanne and Renuga won an 80-shot rally during the third set but unfortunately were defeated 2 sets to 1, going down 22-20, 16-21, 21-18. Leanne also competed in the Mixed Teams Mixed Doubles Event partnered with Ross Smith. Unfortunately the team did not progress to medal rounds. Click here to watch this video which is on the 2012 Australian Olympic Team official website. Congratulation to Ryan Kinner for his achievements at the BWF Para-Badminton World Championship 2017 in Ulsan, South Korea. Ryan started playing badminton as a teenager, in addition to playing soccer and tennis. He has already participated in the two Australian Para Badminton National Championships (November 2015 & February 2016). He finished runner up in Men’s Singles SL 3/4 in 2015, and was a semi-finalist in the same category in 2016. He was noticed as a potential Paralympian in soccer at the age of 13. When he turned 15, he was selected for the Australian team which played in UAE, Ukraine, Spain, Canada, Denmark and England. 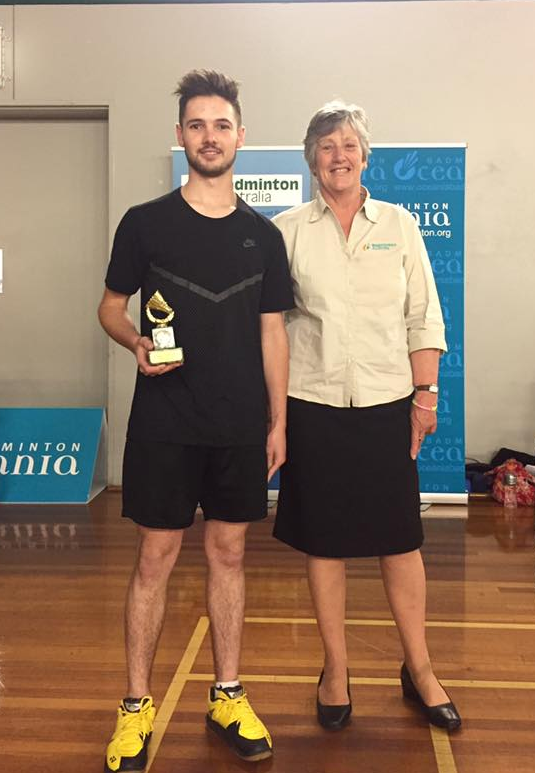 2016: Runner up in the Australian Para-Badminton Championships SL3/4 Men's Singles. A fantastic effort to reach the finals at his first tournament. Kate has been a member of the Sturt Badminton Club from when she started playing the game at twelve years old under the coaching of Kevin Conlon. Kate represented our club starting in C Grade and then graduated through all the senior grades until she moved interstate to train with the Australian Squad, but still remained a valued member of our club. 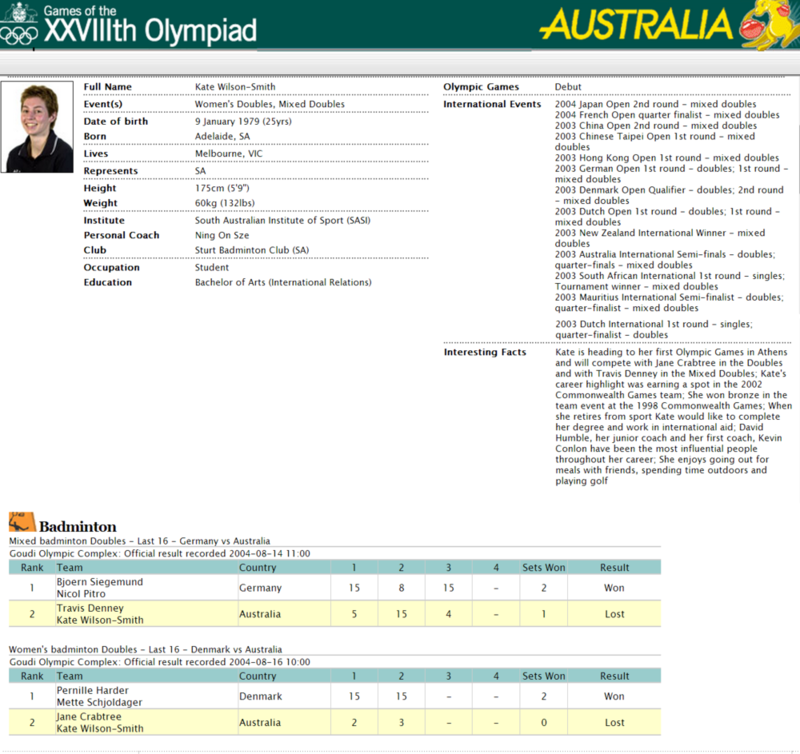 Kate represented South Australia on numerous occasions at both junior and senior level. In 1996, Kate won the Girls Singles, her first of many National Titles, at the Under 16 National Carnival held here in Adelaide at the Golden Grove Sporting Complex. Kate has also competed at the highest level and has represented Australia both at the Olympic Games and Commonwealth Games. Kate made her Olympic debut at the 2004 Athens Games. She joined with teammate Jane Crabtree in the women's doubles event going down in the round of 32 to their Danish opponents Pernille Harder and Mette Schjoldager. Kate also teamed up with Travis Denney to contest the mixed doubles losing to Björn Siegemund and Nicol Pitro of Germany. At the 2010 Delhi Commonwealth Games , Kate paired with He Tian Tang to win Australia's first Commonwealth Games medal in badminton in 12 years. The pair claimed the women's doubles bronze medal in a closely fought match between England's Jenny Wallwork and Gabby White. Post match interview with Leanne Choo and Kate Wilson Smith after they claimed victory in the women's doubles at the 2010 Oceania Championships. Post match interview with Australia's Glenn WArfe and Kate Wilson-Smith after they claimed the 2010 Oceania Championships Mixed Doubles title.